Even just a passing glance at the cover to the graphic novel Colder lets horror and psychological thriller fans know that they’ve stumbled onto something special. The blue-tinted face of protagonist Declan Thomas glares back at the reader with deranged menace, while Declan’s own hand probes the folds of his skin, one finger protruding from a red-rimmed eye socket. 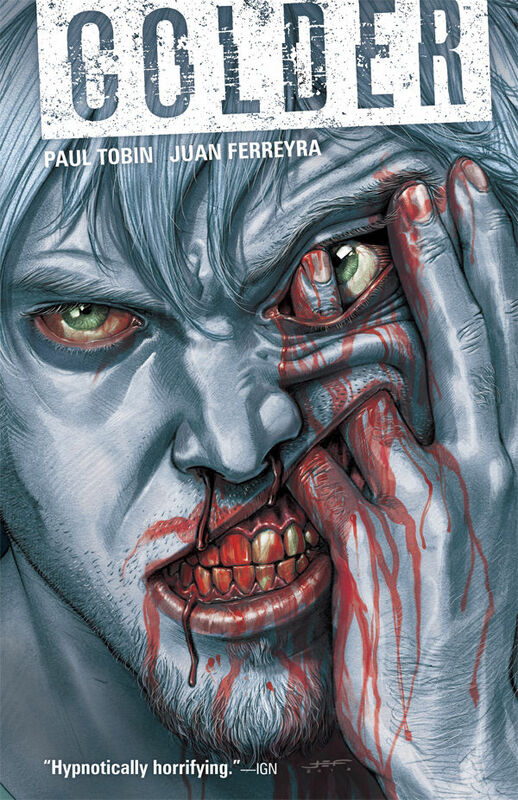 Just why our hero would want to go digging around inside his own skull is one of the many secrets that eventually comes spilling out in Volume I of this gruesome shocker penned by Paul Tobin and beautifully captured by artist Juan Ferreyra. The story begins in 1941 in a setting familiar to all horror lovers: an insane asylum, replete with Gothic archways, winding staircases, and roaming mental patients. A horrific fire erupts, engulfing the asylum and most of its residents. Our lone survivor is cover-star Declan Thomas, whose own insanity has rendered him mute and catatonic. Cursed with a dropping body temperature by a snarky demon known only as Nimble Jack, Declan falls under the tender care of an attractive nurse named Reece. Together, the two of them must find a way to defeat Nimble Jack and a host of other demonic creatures before Declan’s body temperature falls to zero. As Declan brings Reece into this supernatural and sinister world, Nimble Jack’s war against them grows more unhinged and more bloody with every turn of the page. With each passing chapter of Colder, Tobin’s “chiller” of a story becomes more richly layered. Readers discover that while Nimble Jack grows stronger by feeding off of the insanity of others, Declan has the ability to cure the mentally ill and put an end to their various afflictions. While Colder remains wonderfully dark and nightmarish throughout its five chapters, Tobin treats the mentally ill with dignity and respect, generating pathos in the reader. This emotional core remains embedded in the graphic novel through the very end, as the story comes full circle and readers unlock the secrets behind the mental asylum and Declan’s own supernatural abilities. While the character of kindhearted Reece takes a backseat to the powerhouse conflict between Declan and Nimble Jack, there is the suggestion by the conclusion that she will return with even greater significance in later installments of the saga. In addition to Tobin’s intriuging storytelling, Ferreyra’s artwork resounds with cinematic power. Gorehounds will delight in Colder’s many blood-drenched panels, which include scenes of flesh-eating dogs, deformed monsters, and other grotesque entities that seek to destroy Declan and Reece. But it’s when Nimble Jack inhabits the bodies of the mentally ill that Ferreyra really lets it rip, showcasing his ability to depict gore-laden imagery in rich colors that burst from the page. The fight scenes between Declan and Nimble Jack are equally explosive and violent, and the artist evokes these reactions with details that look almost wet to the touch. Burning flesh, eviscerated tongues, hulking creatures with gaping jaws, falling bodies that go splat—it’s all here, satisfying our lust for gore but also adding to the development of the plot. Colder ends with some unanswered questions—just how did Declan Thomas end up in that creepy asylum in the first place? Why did Nimble Jack curse him with a dropping body temperature and how will this affliction affect Declan’s budding relationship with Reece? These questions, among others, will hopefully be answered in the next volume. I hope to see more of Reece and learn her backstory, but I also hope that Tobin continues to explore minor characters as well (in this volume, a hefty female cop and a six-pack-carrying “crazy” feel like flesh-and-blood people despite their small roles). From its mysterious beginning to its frenetic end, Colder is a fast-paced and original horror-thriller worthy of your attention.